The TRS 5100 benefits from Marco’s latest generation of electronic refraction technology. 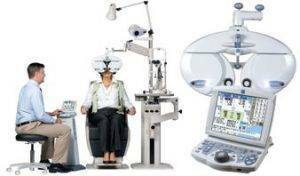 Replacing the standard refractor, it allows practitioners to control the entire refraction process from a keypad small enough to sit in the lap. This keypad also controls the CP-690 Automatic Chart Projector. And because the TRS 5100 is completely programmable, all the lenses are moved at the touch of a button, taking to each new refraction step. While convenient, it is also helpful if delegate refractions and want the technicians to perform the refraction steps in a specific order.